They no longer remember how to get dressed, cook food or show love. Their clearest memories are sixty years old. Curiously enough, in Slovenia, dementia is an illness surrounded by taboos. “We’ve got a long way to go. In Slovenia, people talk about dementia as a mental illness. Few dare admit they’re becoming forgetful and many seek help far too late,” says project leader Marjeta Vodoncnik, of Slovenia’s Research Institute for Education and Development. In Celje, a city east of Ljubljana, she is in the forefront of a different kind of combat. One that aims to eradicate prejudice against something that occurs in all societies. Through the “Living with Dementia”-project, Marjeta and her sister Alenka have established a local Memory Centre, offering advisory services, activities, training for home visitors and interdisciplinary monitoring of families and dementia patients. The project is financed through the Norway Grants, with a view to making life a little easier for people with dementia in Slovenia. Nine elderly ladies sit around a long table at the Memory Centre with their daughters. They’re trying to remember. “Yes! I was right,” exclaims 86-year-old Milka, proudly showing us a picture of a clock and a card with the corresponding word written on it. The others applaud Milka’s accomplishment. Three years ago, Milka took a memory test at her doctors. Her daughter Andrea still remembers the feeling of anxiety when the test results came through. “Alzheimers. What does it mean? Should she move into an institution? Should we remove her freedom? I didn’t know what to do before I found this project. We’ve been given advice here by the psychologist and the doctor. It’s important for us relatives to understand what’s happening,” says Andrea. Tired of seeing her mother disappear, slowly but surely. “She isn’t Mum any more. Before, she was always happy and optimistic, but now she’s often angry. Sometimes, I feel as if I’m her mother. The hardest thing is dealing with the lack of empathy – she never asks how I’m doing,” says Andrea adding that it pains her to see her warm, considerate Mum vanish and become a patient. Mojca identifies with that; after four years looking after a sick mother-in-law, she’s glad that respite services exist. “I’ve got a new child. I like to join in with the memory exercises because it’s good to meet other relatives in the same situation. There’s a kind of security in knowing that other people are going through the same thing,” says Mojca. In Slovenia, the health authorities didn’t recognise dementia as an official illness until 2013. There are no statistics on how many people are suffering from dementia and research into the illness has so far been in short supply. “The population is getting older and older – calculations show that there will be three times as many people with dementia in 2050 as there are today. We must prepare ourselves to find ways of dealing with it,” says Marjeta. So far, 50 volunteers have been trained to be home visitors for dementia patients. Through increased awareness of dementia, the project hopes to remove the stigma and lower people’s threshold for seeking help. “Every week, we have 20-30 enquiries from people. Last week, we had a call from a desperate man in his fifties. He was at an airport and couldn’t understand what he was doing there. The man travelled a lot for his job, but his brain suddenly disconnected at the baggage carousel. He was crying and afraid. We urged him to take a test at his doctors; we haven’t heard from him since,” says Alenka, who coordinates the project with her sister. 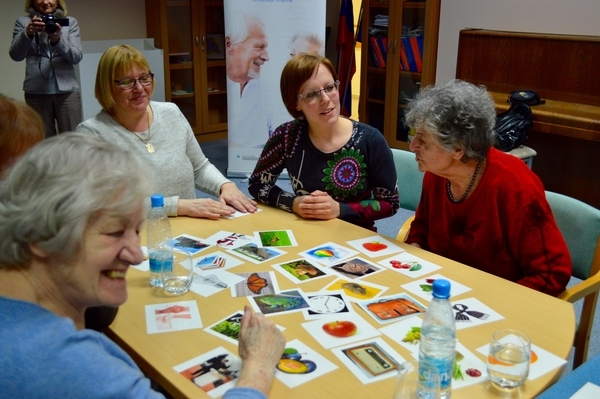 The project ‘Living with dementia’ is part of the ‘Public Health Initiatives’ Programme, whose primary aim is to improve the public health system and reduce the gap in healthcare provisions in Slovenia. When the Memory Centre was being set up, the Vodoncnik sisters wanted to combine the best practices from equivalent centres in other countries. The centre at Norway’s Stavanger University Hospital was one of the pioneering models. Research nurse at Sesam, Stavanger University Hospital, Martha Therese Gjestsen, thinks the project is a good example of the importance of local and international collaboration in Europe. “We learn from each other, exchange experiences and our project gains greater weight as a result. When they visited us, they met people doing clinical work on dementia as well as researchers; they gained an insight into how we collaborate across different sectors. When we’re invited back to Slovenia, it’ll be exciting to see how they work,” says Gjestsen. After the project ends, the sisters want to keep the Memory Centre going. “There are a lot of people who are forgetting and a lot who need help. Now we’re trying to find new funding to further develop the centre,” says Alenka.